Massachusetts ghost towns exist as empty holes in the ground. Nothing remains of the home our town except a stone cellar. Sometimes you can see old, broken bottles, or bits of pottery shards, the only reminders that once upon a time, there was a family, or a town that had lived there. If so, then searching for these lost old towns, and abandoned buildings will give you the opportunity to find some exciting relics from the past. This page explains where some of the ghost towns exist. How to locate these eastern ghost towns is completely explained throughout my website. 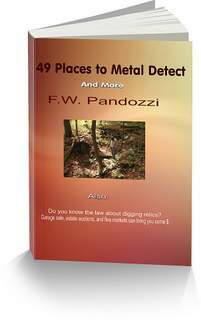 And, Massachusetts ghost towns are great place to metal detect. Here is a list of some of those gone but not forgotten towns. Have fun, and good luck in your search for the old towns. Cataumet, is located approximately 1 mile southwest of Pocasset. State Line, is located approximately 2 ½ miles southwest of Richmond. Crystal Spring, is located approximately 1 ½ miles southwest of Assonet. Attitash, is located approximately 2 miles west of Amesbury. West Gloucester, is located approximately 2 ½ miles west of Gloucester. Elm Grove, is located approximately 3 miles north of Colrain. Athol Center, is located approximately 1 mile southeast of Athol. Fayville, is located approximately 2 miles east of Southborough. "Gone But Not Forgotten, Ghost Towns of the Eastern States." 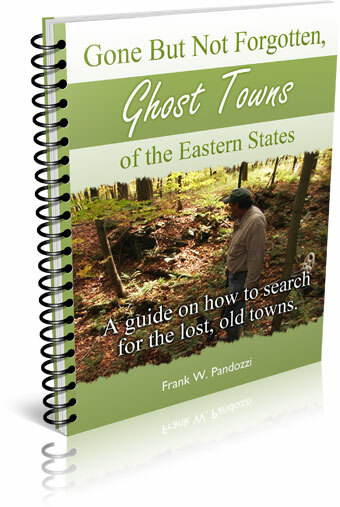 In this ebook, learn how to locate the eastern ghost towns by recognizing certain signs. 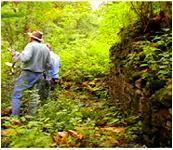 And if you enjoy metal detecting, read about a real ghost town mini cache my partner John located. Available only as an instant download.